As the old saying goes, anything worth doing is worth doing right. Mine rescuers have always taken such thoughts to heart, with many committed to their skill sets and eager to keep them tested and polished for the day they continue to hope will never occur — a true mine emergency. 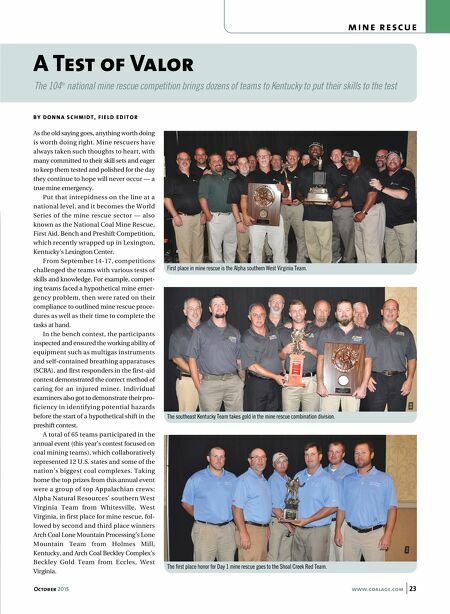 Put that intrepidness on the line at a national level, and it becomes the World Series of the mine rescue sector — also known as the National Coal Mine Rescue, First Aid, Bench and Preshift Competition, which recently wrapped up in Lexington, Kentucky's Lexington Center. From September 14-17, competitions challenged the teams with various tests of skills and knowledge. For example, compet- ing teams faced a hypothetical mine emer- gency problem, then were rated on their compliance to outlined mine rescue proce- dures as well as their time to complete the tasks at hand. In the bench contest, the participants inspected and ensured the working ability of equipment such as multigas instruments and self-contained breathing apparatuses (SCBA), and first responders in the first-aid contest demonstrated the correct method of caring for an injured miner. Individual examiners also got to demonstrate their pro- ficiency in identifying potential hazards before the start of a hypothetical shift in the preshift contest. 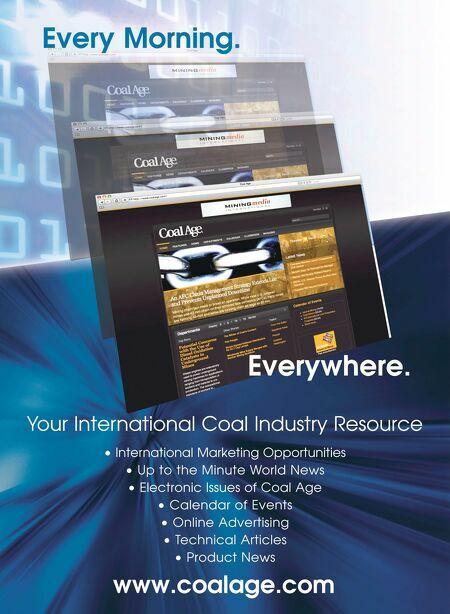 A total of 65 teams participated in the annual event (this year's contest focused on coal mining teams), which collaboratively represented 12 U.S. states and some of the nation's biggest coal complexes. Taking home the top prizes from this annual event were a group of top Appalachian crews: Alpha Natural Resources' southern West Virginia Team from Whitesville, West Virginia, in first place for mine rescue, fol- lowed by second and third place winners Arch Coal Lone Mountain Processing's Lone Mountain Team from Holmes Mill, Kentucky, and Arch Coal Beckley Complex's Beckley Gold Team from Eccles, West Virginia. m i n e r e s c u e First place in mine rescue is the Alpha southern West Virginia Team. October 2015 www.coalage.com 23 B Y D O N N A S C H M I D T , F I E L D E D I T O R A Test of Valor The 104 t h national mine rescue competition brings dozens of teams to Kentucky to put their skills to the test The southeast Kentucky Team takes gold in the mine rescue combination division. The first place honor for Day 1 mine rescue goes to the Shoal Creek Red Team.